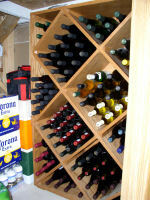 We used to have a simple wine rack with a storage capacity of 30 bottles; plenty for our limited consumption. But when we came back from a wine tour to Penticton in British Columbia we suddenly had to store an additional 5 cases of wine (60 bottles). The design you see here is what I wanted to make. It has a capacity of 172 bottles: 16 per square and 6 per triangle. 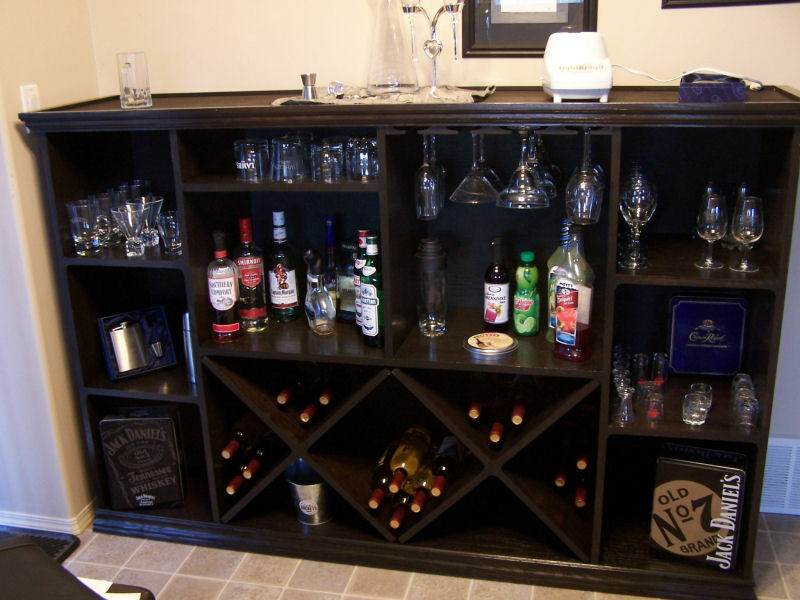 The one I actually made is 10" lower due to limited storage space under our stairs, and holds 144 bottles. This is actually an easy project, but I classified it as intermediate as it requires very accurate cutting of the panels. 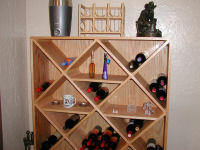 Pete Peterson made this version of the full wine rack as a Christmas present for his wife. He said: "I had a little trouble as my radial arm saw wasn't exactly square when I started, and I had to use several ratchet straps to get it to come together. I also made some loose drop-in shelves to give my wife a place to put some nick-nacks. 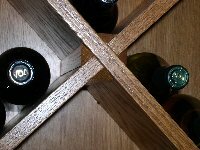 The nice thing about these shelves is that they are not attached, so when you buy more wine you simply remove the shelf to make more room." Excellent job Pete, and thanks for sharing that shelf idea. Jessica Thorkelson wrote this, "I just wanted to thank you for the plans you put on your site. It inspired my husband and I to come up with this side bar plan. 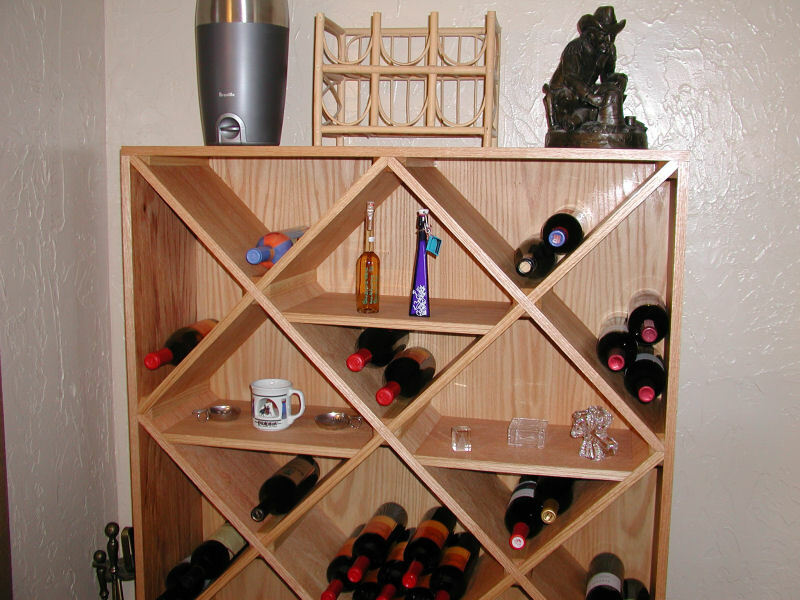 He makes wine and we needed a wine rack as well as a place to store all our glasses. 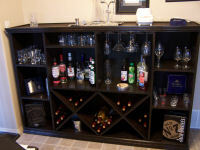 Once we get more wine the shelves will probably be taken over a bit by wine, rather then the temp stuffers that we have. We haven't finished the top yet. We plan to suspend pictures in a 1/4" thick coat of Envirotex. We haven't come up with a design for it yet, so we are waiting till we are both pleased with what we have come up with." 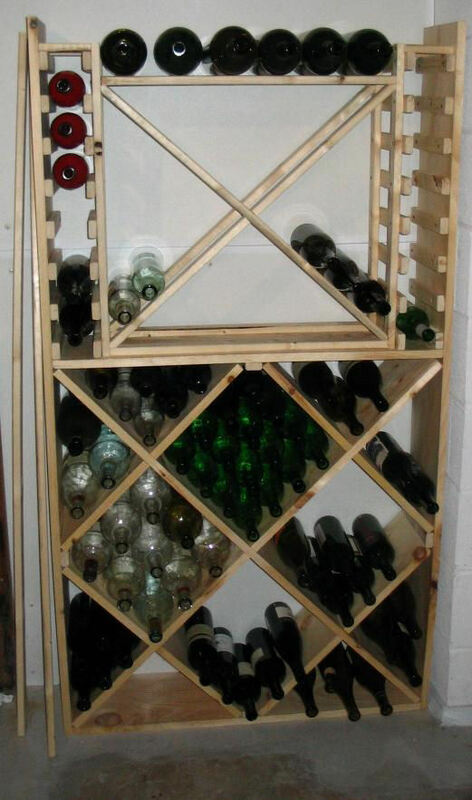 Another unique way to make their own style of wine storage. Very nice job Jessica and Curtis. Christian Adams used my design, but when he was in Home Depot looking for wood the ideas were flying through his head. The end product holds about 200 (750 ml) bottles. My concern was that the middle top section might not be strong enough to pack a large amount of full bottles, but this is what Christian said, "It has been tested already. The flat rails at the top will hold just over 45 pounds, and the top center cross rack will hold just over 80 pounds. I had a great time testing it. Nothing like loading a bunch of dead weight on scrap wood to see what happens". I like Christian's approach, and like his project too. The 8 feet solid red oak board for the triangles has a finished size of 3/4" by 4 1/2". It is just enough to cut the triangles from it, but it gets pretty dicey -- read very unsafe -- to cut the last 3/4" by 1" piece in half. Therefore I strongly recommend that you buy at least a 1" by 6" board to give yourself something to hold on to. Power tools -- table saw, compound miter saw, random orbit sander, biscuit saw, iron. Hand tools -- sanding block, tape measure, (strap) clamps, hammer, utility knife, 3/4" chisel, cross-cutting board. Cut all the pieces according to the sizes in the materials list. 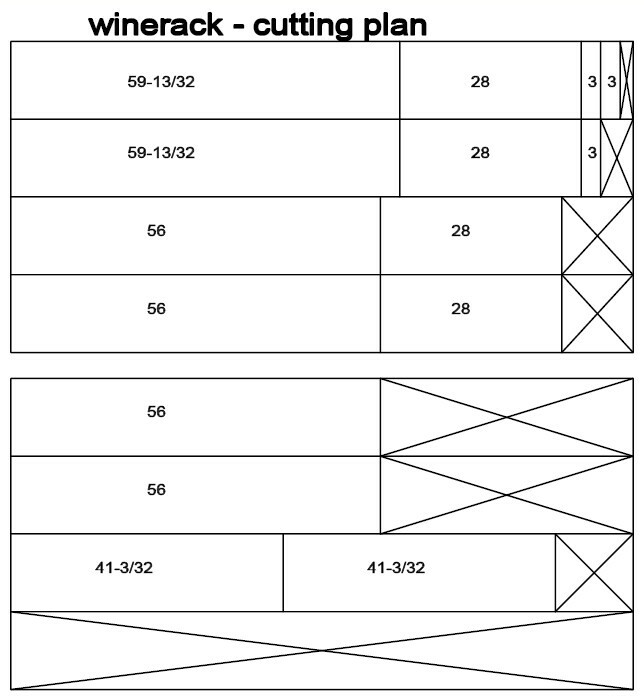 Next cut the slots in the diagonal panels and taper the ends as described in the the section below. This is a good time to dry fit everything together on its back on the ground. Keep things together with a strap around the outside. When you are happy with the fit then it is time to work on the top/bottom and side pieces. I use three #20 biscuit at each joint. 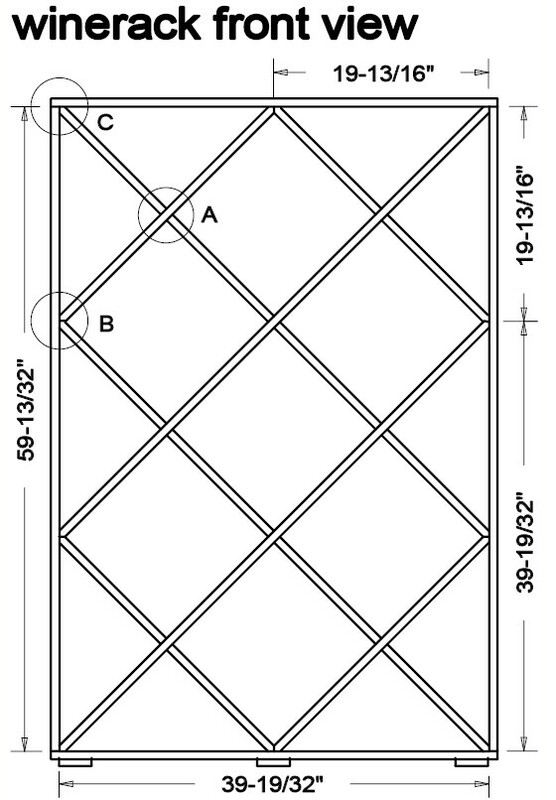 Make sure that you stick to the inside measurements as indicated in the top drawing. Alternatively you can use three 2" screws per joint; don't forget to pre-drill and countersink. One more dry fit just to make sure. Before taking it apart mark the front side of all panels. Next warm up the iron at high (linen) as it is now time to veneer the edges of the various panels with the pre-glued veneer. Cut off a piece of veneer about 1/2" to 1 " longer than what is needed. Lay it on the edge that needs to be veneered and slowly iron it on. It needs several passes. Be careful as the surface gets hot and the edges of the veneer splinter easily. Take a 2" by 3" block of wood and press it over the veneer making sure that there is good contact between the veneer and the panel side. After it is cooled down take a sharp utility knife and carefully cut off the excess veneer. Using a sanding block with 220 grid sandpaper sand the veneer edge flush with the panel and finish it with sanding the edge at 45° in one or two passes. First do the sides and then the front of the top and bottom pieces. Then do all the marked front edges. For the panels with the slots at the front glue a whole strip of veneer in place. Finish as described above and finally carefully cut away the veneer at the slot opening. For the foot pieces do the sides first and then the front. Put the biscuits with glue in the top and bottom pieces, put glue in the biscuit slots and on the edges of the side pieces, and put everything together on its back on the ground. Make sure that the veneered side are in the front. Put one or two straps around it as tight as possible. 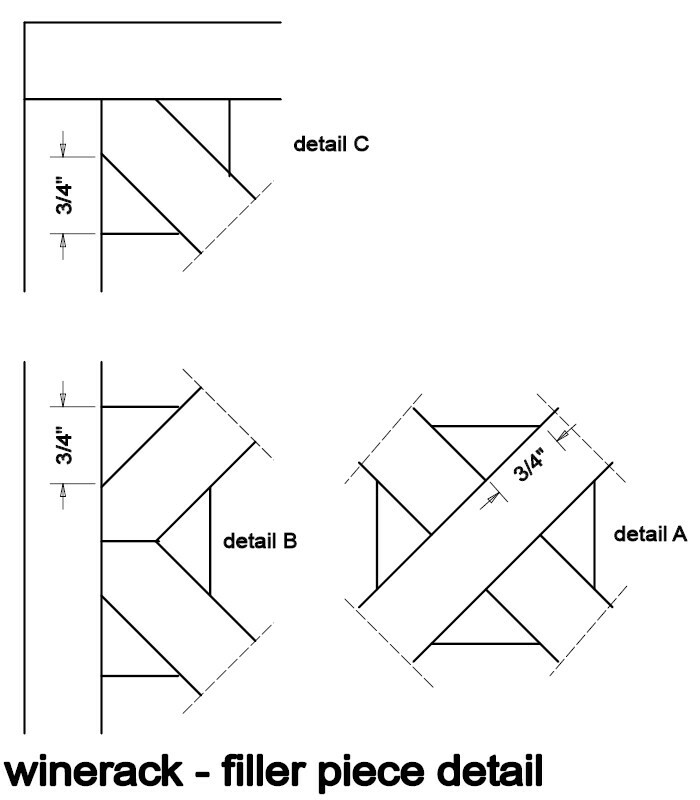 Ensure that everything is square by measuring the diagonal opposite corners making them the exact same length. Let it dry overnight. Nail the back board in place with a few temporary nails. Check that the top, bottom and side panels are all straight. Put the whole lot back on its back. Place all the diagonal panels inside without glue. Adjust where needed and use clamps to make everything fit nice and snug. Next the triangle filler pieces need to be glued in place. The triangle filler pieces need to be tapered at 45° towards the point where the various panels come together. You need 38 pieces tapered towards the 90°, 10 tapered towards the left 45° and 10 tapered towards the right 45°. Study the drawings above. The best way is to make a few jigs and use the compound miter saw. A tedious job, but it gives a professional look. Apply glue to the two surfaces and put in place. Take your time. Do the corners first and let dry for half an hour. Then do the other edge joints and let dry for another half hour. Try not to shift or bang against the wine rack while gluing the triangle filler pieces. Do the rest and let dry for a whole day. 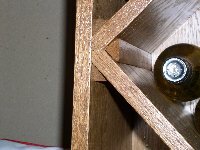 Glue the three feet in place and use a few finishing nails to keep them in place. Finally put the wine rack face down. Take the back board off. Apply a little bit of glue on various strategic edges of the panels and then put the back board in place securing it with the finishing nails. 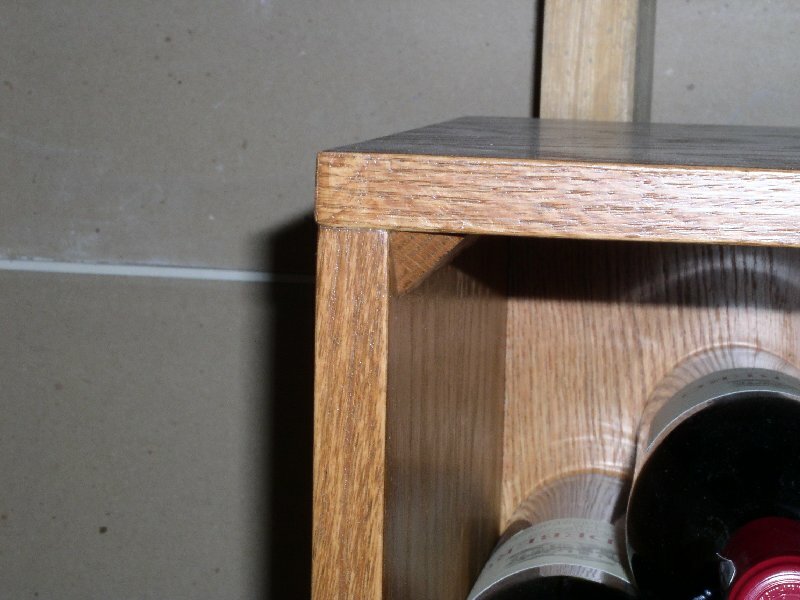 Stain it with a colour that you like and finish it with at least two coats of an acrylic urethane varnish. When you need help sampling the wine... well, you can always contact me. The required slots in the diagonal panels are 3/4" wide and a little bit deeper than 5 7/8" or a wee bit more than half the panel width. 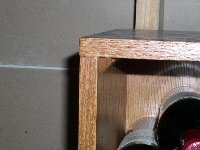 A 3/4" dado would be fine, but my experience is that a 24 teeth dado gives a lousy finish on plywood. In this case the recommended tool is your good old table saw with a 10" 80 teeth fine finishing blade. Use a cross-cutting board with the blade set as high as possible. Yes you have to make two cuts per slot and your need a (3/4") chisel to clean up. The 28" panels have one slot and the 56" panels have three slots. After the slots are done put your blade at 45° and using the cross-cutting board again cut off 3/8" of both sides at both ends of the panels (look at drawing detail C). Make sure that you do not cut off too much as that will shorten the panel and results in a very sloppy fit. The trick I use is to draw a pencil line at the center of the panel end. The idea is that the pencil line should just be visible when you are finished tapering both sides. This is the real challenge of the project. Updated: 5-Feb-2019 21:40 EST -- Copyright © 2003-2019 Pieter van Vliet. All rights reserved.